What comes to mind first in remembering the former Krauss Department Store are the chimes. In the early days of such stores there was a system of bells with the number of rings designating some staff member. If, for example, the manager was needed there might be three chimes that would send him scurrying to an in-house phone system. Other personnel would have different combinations. At Krauss, chimes were like a symphony. Just during the time of a ride up the escalator there might be several signals. By the last year of Krauss, which lasted from 1903 to 1997, chimes were extinct in most department stores, but not there. Another throwback was the credit system. In the days before everyone carried credit cards a clerk would write up a charge slip. Then the slip would be put into a pneumatic tube system, sort of like what is still used at drive-through banks, to be whisked to some hidden away credit office, from which would come the verdict whether or not to approve the sale. The system, with its capsules racing from floor to floor, was both old fashioned yet somewhat jet-age. It certainly had style, more so then waiting for a computer to approve a credit card. Krauss was locally owned to the very end, and that in itself was unusual as other hometown department stores had succumbed to national operators. It had a brief expansion with a suburban store at Lakeside Shopping Center, but that did not work out. Here fate probably intervened because it should have been written that there should only be one Krauss Department Store. There were other quirks that added to its reputation. 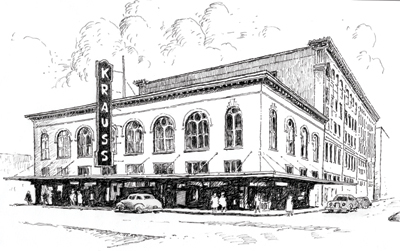 Krauss was known as THE place for buying fabrics. Many dresses made for balls or proms were home-stitched with Krauss’ cloth. It also had an impressive collection of ladies’ hats worthy of Easter Sunday or promenades along Canal Street, back when people still dressed to go downtown. The Krauss experience frequently included a stop at the lunch counter on the mezzanine where the food (served on a Formica counter to customers perched on round red stools) always had a good reputation, especially for a department store. What really gave the place its historic legacy were some of its customers from the early days. The other Canal Street department stores were closer to the river; Krauss stood alone at Basin Street. It was the closest store to Storyville. Legends tell of the ladies of the red light district shopping at Krauss for lace, satin and other niceties. Many bordello bound gentlemen, some having arrived at the former nearby train station, might have stopped there too for that extra embellishment. Storyville closed in 1917 (this year is the centennial) so Krauss was able to last for a long time without the bordello business just on its own style and inventory. I recently attended a cocktail party held on what is now the pool deck of a building called the 1201 Canal Condominiums. It is the Krauss building converted to a chic residential property. From the deck I tried to envision the surrounding business district as it looked in Krauss’s day: There was the Roosevelt Hotel in the distance; the Canal Line streecars (then green rather than red); the skyline made jagged by bank towers; the river in the distance and the Saenger Theater, its marquee now more radiant than ever. Much has changed too; the old department stores Maison Blanche, Holmes and Sears are gone, though their buildings are now hotels. Other buildings, like Krauss, are nests for condominium dwellers. That’s not all bad. Having residents, and not just day-trippers, is good for the vitality of any downtown street. I do wish though that those who live there could somehow know what Krauss used to be. It was a last-of-a-kind place that was suddenly taken away– as though in a pneumatic tube.